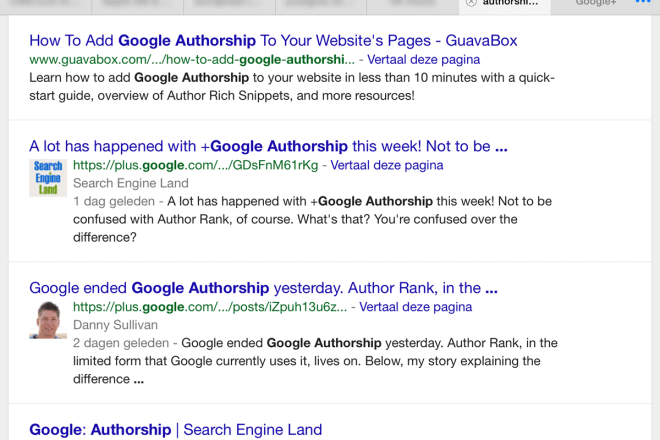 Why would Google end authorship? A short recap of what has been said so far about why Goolge choose to kill this. The first reason was a low acceptance rate. 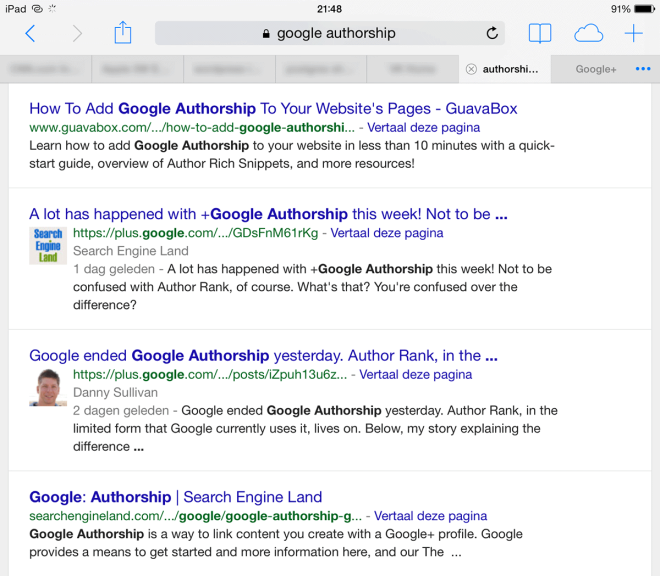 Too many sites were slow to adopt authorship. For the non-tech-savy writers it proved to be too much of a hassle I guess. The second reason is more interesting. John Mueller wrote that it did make a lot of difference in the click trough rate on search results! That bit of information put my mind to rest about this whole authorship thing. I’ve always found it odd that I observed myself to be less inclined (!) to click on a search result with a picture than a result without one. An exception where cases where the picture was of someone (or an brand) I recognized. 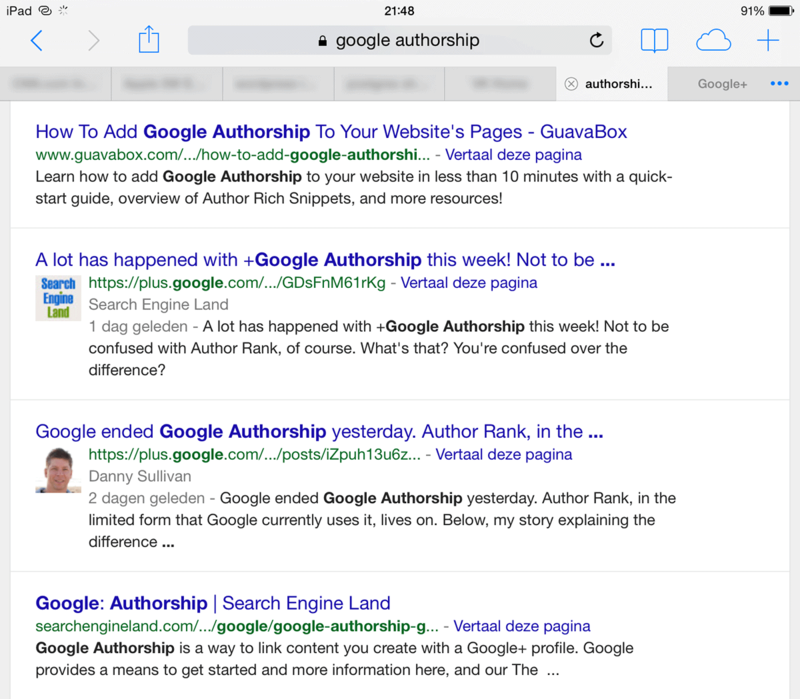 Since most SEO colleagues seemed happy with the results of authorship I thought that it was just my personal preferences getting in the way. Perhaps a case of ‘banner blindness‘. But — following Google’s logic — I could have relied on that instinct a bit more than I dared to… A third — to my opinion minor — reason that has been quoted is that Google wanted to keep mobile and browser search as consistent as possible and that in Mobile browsing it was hard to incorporate the pictures. That could be true of course but if authorship was a big hit, I guess they would have found a solution for that. Strange though that it is still being used for Google+ pages. If it is not helpful for the user experience and “can even distract” why keep it around for the Google+ pages? So let’s keep an eye on those results see if Google will put their money near their mouth. Or are they (again) taking another step into plugging their own products in the whole search experience? I’d also say don’t worry too much about Author Rank. It’s only confirmed for a very limited part of Google Search. Maybe it will grow beyond that. If it does, it’ll be only one of many SEO ranking factors that go into producing Google’s listings. So if you do not have that covered yet, no reason to panic.